2015 has been a really busy and successful year for IRiS. 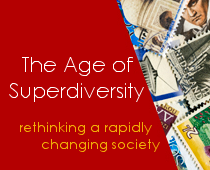 Our highlights for 2015 include a number of new high profile research projects as well as numerous publications and research related events around superdiversity and migration. Jenny Phillimore’s UPWEB hit the street this year with fieldwork in full swing. The study is funded by NORFACE and focus on health-seeking behaviour in residents living in superdiverse neighbourhoods. Dr Susanne Wessendorf started her Marie Sklodowska-Curie project “Pathways of settlement among recent migrants in superdiverse contexts”. The AHRC-funded “Translation and Translanguaging: Investigating linguistic and cultural transformations in superdiverse wards in four UK Cities” (T-LANG) led by Professors Angela Creese and Adrian Blackledge has marked some important milestones. Dr Nando Sigona’s ESRC study “Becoming Adult: Conceptions of futures and wellbeing among young people subject to immigration control in the UK” is fully undergoing and Rachel Humphris joined the research team in October as research associate. The EU’s refugee crisis has seen many IRiS researchers engaged in contributing to the public debate with high profile intervention in national and international media, including New York Times, Al Jazeeera, BBC, Liberation, L’Opinion, The Economist, The Guardian, The Independent, Channel 4, ITV, Swiss National TV. Dr Arshad Isakje contributed to a ground-breaking public health investigation in the Calais refugee camp in collaboration to Doctors of the World that led to extensive international media coverage. In response to the on-going migration crisis Dr Nando Sigona co-led an international research team for ‘Unravelling the Mediterranean migration crisis’ (MEDMIG) funded under the new ESRC’s Urgency Grants scheme. Dr Aleksandra Kazlowska has finished research for her Marie Sklodowska-Curie project “Social Anchoring in Transnational Social Spaces”. Nando Sigona’s “Campzenship: Reimagining the camp as a social and political space” (Citizenship Studies) and an edited volume Diasporas Reimagined: Spaces, practices and belonging (University of Oxford). Angela Creese and Adrian Blackledge’s work on language and superdiversity has been published in the paper: “Translanguaging and identity in educational settings” (Annual Review of Applied Linguistics) and in the book Ethnography and language in the social sciences: collecting, analysing and presenting data (SAGE). The IRiS Working Papers Series featured 7 new papers on civil society organisations and destitute migrants; the urge for incorporation of superdiversity in the European Court of Human Rights’ jurisprudence; strategies of coping with language differences and new migrant enterprises in a super-diverse context; a local and experiential perspectives on migration and integration and the challenges of superdiversity for social housing. Among many events hosted by IRiS in 2015 two international interdisciplinary conferences can be highlighted “Rethinking integration: New perspectives on adaptation and settlement in an era of superdiversity” (2nd July) and “Intersecting Discourses on Migration in the UK, Germany and Russia” (5th November). Three inspirational roundtables gathered a wide audience: “Intersectionality and superdiversity: what’s the difference?”, “Superdiversity – Opportunity or challenge for addressing inequality?” and “Race and superdiversity: what are the links?”. The IRiS Practitioner Research Programme, led by Lisa Goodson, recruited and commenced training with its second cohort of learners in November 2015. Doctoral Researcher Diversity Network has continued to support PhD students interested in diversity and facilitate their research. Prof Kiran Trehan has won the 2015 “Best in Education” award at the British Indian Awards and Prof Jenny Phillimore has been elected a member of the Academy of Social Sciences. Dr Nando Sigona has been appointed as Deputy Director at IRiS.